This summer, we were happy to collaborate with Tatsuya Takahashi and Christoph Hohnerlein on a project which led to an interesting little device, the Granular Convolver. It all started when Tatsuya was at our office and wanted to discuss granular synthesis. 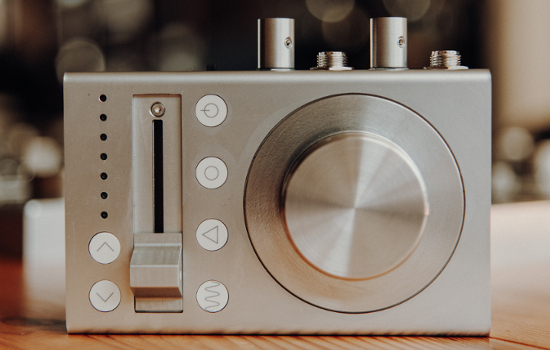 Inspired by Tasty Chips GR-1 and Robert Henkes Granulator II, he wanted to create a device which would allow the participants of the Red Bull Music Academy to experiment with sampling and manipulated sonic memories. This is where we introduced Convolution to the equation, a process which can be used to imprint sonic properties from one sound onto another. The most common use of convolution in audio is in reverbs where audio input is often convolved with an impulse response, but the possibilities are not limited to that. A small grain of a sample carries all necessary information about the contained frequencies as well, and characterizes its timbre and tonality. Besides many others, Mark Durham has a nice article about creative convolution with sound examples on his blog and Sound on Sound made a writeup about it as well. So whats new you may ask? Well, we thought this technique deserves a proper device, so we crammed a computer to run the power hungry algorithms in a little hand-held box. For us, it was a great opportunity to try out the super powerful Raspberry Pi Compute Module, build a custom linux operating system based on buildroot and install SuperCollider on it to run the audio algorithm. As of now it is a design study and probably won’t be available in the present form as a product – but it lead us on a path of creative uses of convolution, which we happily continue to explore for sure! In the meantime, check out Mitjas session with the Granular Convolver, which lead to the track below, as well as our in-depth lecture here.